Ever wonder why you cling to your “stuff” so tightly? The “endowment effect” states that we all tend to prefer the items we own when compared to similar items that we do not own. “It’s mine!” is our strongly voiced opinion from the very first days that we can speak. When researchers studied the brains of volunteers through fMRI they found that three different brain areas were activated during those times when we are prompted to declare ownership. Initial results indicate that the endowment effect is not promoted by our enhanced attraction to possessions but rather that ownership increases value by enhancing the significance of the possible loss of preferred products. Losing something that we like is more significant than the actual ownership of the item. It is also threatening – and we tend to be motivated more by aversion to loss than attraction to gain. And as we’ve said in the past, threat is a powerful emotion that gets our attention quickly. The element of surprise only intensifies the effect. Try and grab a favorite teddy bear from a three-year-old and watch how quickly “It’s mine!” kicks in. Aversion to loss lies at the heart of the strength of our attachments to things. When there is little risk of losing something it’s often surprising how little value we find that we actually attach to it. Where is a History of Feeling? An interesting book review highlights the relationship between experience and brain chemistry among its other items. On Deep History and the Brain by Daniel Lord Smail suggests that one common theme through history is our desire as human beings to alter our moods and feelings. And what I find interesting is that the emphasis is on mood and feelings rather than a more cerebral cognition. This binary disconnect between cognitive thinking and emotion can sometimes be summed up like this, I suspect. I think, therefore I am. I feel, there fore I am ALIVE. Emotion trumps cognitive thinking over and over again in terms of strength in our overall sense of awareness. We exist to feel in profound ways and the great religions of the world have gone into sometimes exquisite detail on the “heart” and its management. It would be interesting, I think, to see a written emotional history comparable in scope to the great intellectual histories. They may exist (and if anyone knows of a good recommendation please post). Smail’s book would to a subset of that category as he focuses upon the more narrow subject of our pursuit of mood altering technologies. But he brings up important questions relative to our continuing efforts to come to grips with both our thinking and feeling selves. In the brain of the beholder? 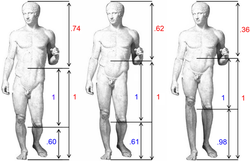 A study in which art criticism-challenged subjects (most of us) were asked to view sculptures in which the classic Golden Ratio parameters were tweaked suggests that our perception of visual beauty is partly instinctive and partly learned. Test subjects showed more activity in the brain’s limbic insular cortex, part of our emotion mediation system, when viewing sculpture that has been deemed classically beautiful over the ages. Perhaps, as people, we share more in common across cultures than we sometimes admit. The brain acts as a complex choreography of cooperating physiological structures and process systems. Many distinct brain systems work together to solve complex problems. Our goal-oriented behavior involves at least two systems. Another network manages cognitive reserve. There is the distinction between left and right brain processing as well as the interactions between emotional and cognitive systems and structures. Surprise and attraction/aversion involve cooperating networks. And it all works together seamlessly for the most part. Sometimes working seamlessly doesn’t mean working for our best interests. We can distinguish between our reflective (thinking) and reflexive (emotion and reward-seeking) brains. The reflective brain “thinks.” The reflexive brain “reacts.” One continuing aspect of coaching involves managing the reactions of our reflexive brain so that it networks well with its reflective side in ways that support our best interests. This is “coaching Ted” – not always an easy task. One reason is that some actions and the thinking behind them just plain feel good – even when they prove detrimental to us and our reflective selves know it. A recent example is found in David Zweig’s book on investing, Your Money & your Brain: How the New Science of Neuroeconomics can make you Rich. Zweig finds that “Making money feels good, all right; it just doesn’t feel as good as expecting to make money. In a cruel irony that has enormous implications for financial behavior, your investing brain comes equipped with a biological mechanism that is more aroused when you anticipate a profit than when you actually get one.” Which sets up a physiological basis for greed – the behavior feels better than the result which loops to feed more of the behavior.Overcoming such behavior (and coaching to do so) involves saying “no” in a manner that proves stronger than the good feeling. There are many productive strategies for doing so, ranging from the personal accountability of partners and self-help groups to alternative rewards. At their heart they involve bringing reflexive behaviors under the control of our cognitive selves. And that’s easier said than done. He also built his theory on earlier work conducted by Canadian neurosurgeons Wilder Penfield and Herbert Jasper. Their work in removing large portions of cortex in the treatment of severe epilepsy helped isolate physiological bases for “absence epilepsy,” a sudden loss of consciousness, that indicated brain stem involvement in primary consciousness. Merket adds that animal research activity since that time confirms the brain stem’s involvement in primary consciousness. One current discussion involving the brain’s emotional bias is to be found in and circulating around Drew Westen’s recent book, The Political Brain: The Role of Emotion in Deciding the Fate of the Nation. Whatever one’s political persuasion, the book suggests among other things that emotion trumps reason when it comes to choosing political candidates. Westen’s book is based upon studies done at Emory University. The study has potentially wide implications, from politics to business, and demonstrates that emotional bias can play a strong role in decision-making, Westen says. “Everyone from executives and judges to scientists and politicians may reason to emotionally biased judgments when they have a vested interest in how to interpret ‘the facts,’ ” Westen says. The mechanism can be seen as an illustration of confirmation bias, the seeking of information that supports existing beliefs while ignoring or discounting contradictory evidence. What can be done? Factoring in awareness of emotional bias is a start. A process of positive skepticism, as suggested by Michael Shermer (publisher of The Skeptic, no less), might be a useful methodology. And there are many others. What remains foundational, whatever our arena of decision-making, is the strength of emotional bias within our mental processes and the need to manage it well.